An appetising coconut-based steamboat for a change to celebrate the year of the red monkey? Sick of the usual stuff you eat every Chinese New Year? You might want to recommend your family this award-winning restaurant for the upcoming festive celebrations, and the all-important reunion dinner. 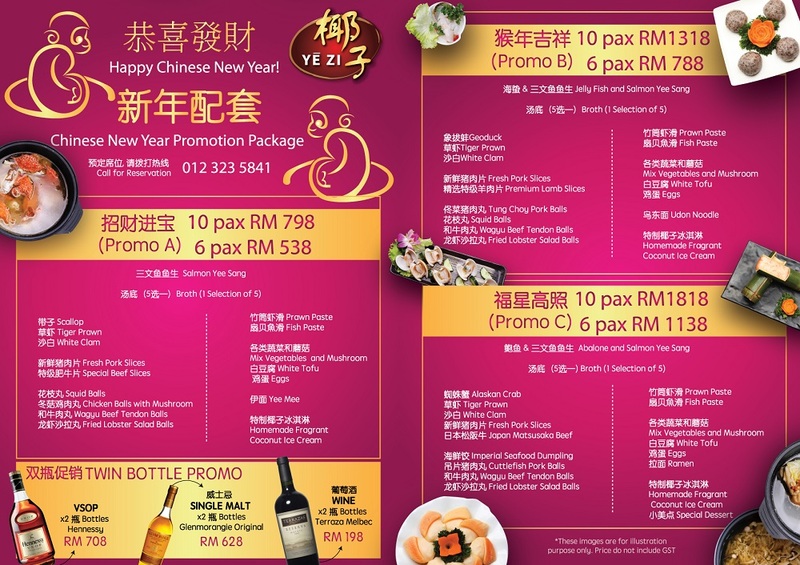 Available now until February 29th 2016 (5pm to 1am), Yezi is offering three Chinese New Year promotional set menu packages that I’ve had the privilege to try, and they’re unlike most common steamboat places that I usually have. 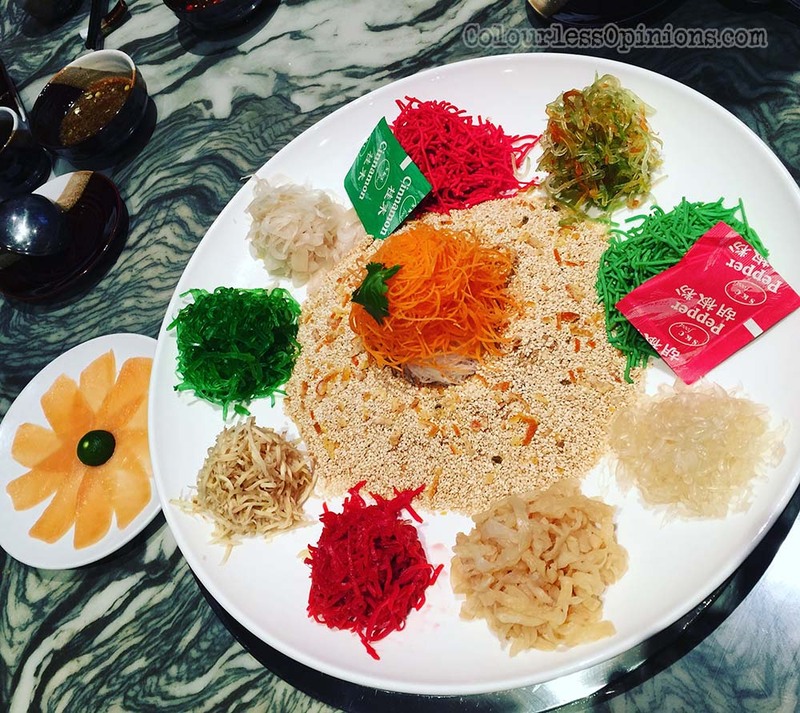 Before we get into the mains, let’s talk about the Yezi Yee Sang ’cause how can you have a Chinese New Year dinner with Lou Sang-ing first? All three packages come with its respective premium Yu Sang but you could also order it on its own separately — Salmon RM68++ for small and RM88++ for big, Jellyfish & Salmon RM78++ for small and RM98++ for big, and Abalone & Salmon RM128++ for small and RM188++ for big — big could cater up to 10 pax whereas small is for up to 5 pax. As you would’ve guessed by the restaurant’s name (椰子), Yezi’s signature broth (the “soup” for the steamboat/hot pot) is coconut-based and they have five different styles and tastes to choose from. The one that I was having on this day was the Wild Forest Truffle Mushroom Broth — vegetarian with strong earthly favours and a bouquet of truffles. It’s nice and unique, I’ve never had steamboat with such delicious broth before, and if you love mushrooms, you’d definitely love this. My personal favourite was perhaps the Imperial Canton Broth that combines sweet cabbage, bacon, coconut and kampong chicken, that somehow tasted like my mum’s sweet herbal soup that I miss so much. It’s so tasty I could just drink it all day long. I do wish I could try the others too some time in the future. Usually, when I go for steamboat, it’s buffet and I get sick of them after just two rounds of it, and I hardly ever go for the noodles and desserts. But I was surprised how absolutely top notch the stuff that Yezi serves — the meat, veges and even the noodles were delicious. The noodles weren’t just mee hoon and anything like that, they were udons! The meat and seafood couldn’t be any fresher (the prawns were still moving even though they had a stick up their behinds, as seen in the photos here). And some of stuff weren’t as straightforward as I was expecting too — one of the types of fish balls even has creamy cheese-like substance inside with a bit of wasabi taste. 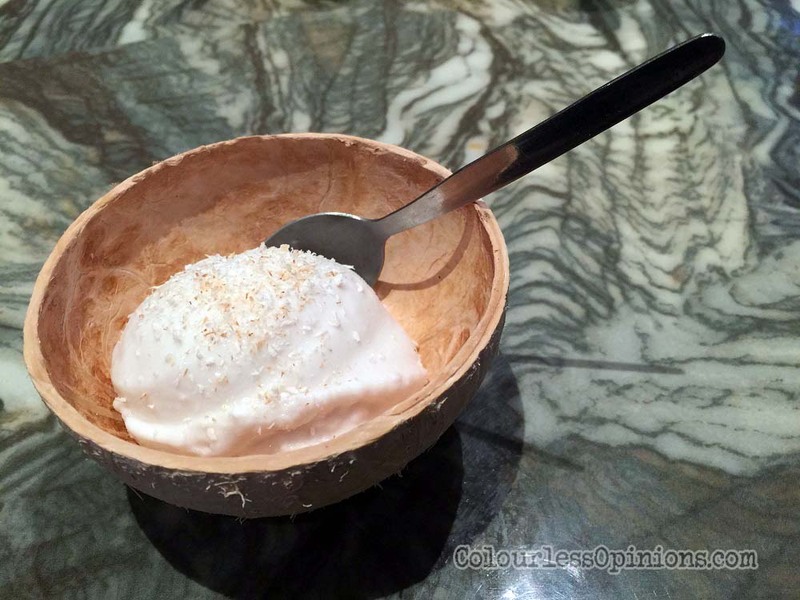 As a finishing touch, the awesome Yezi signature coconut ice-cream dessert is just perfect. Just warning though, it’s so sweet and tasty that it’s far better than the one I tasted in Koh Samui recently and I was craving for more. It’s only a small scoop but if you had more on top of every thing that you had from the package, I can’t guarantee you won’t faint when you check your weighing scale on the next day. That’s not all! If you dine during the 15 CNY days, your table will get to dip into a “Ang Pao Fortune Box” with a total value of RM8,888 in food vouchers up for grabs. In conjunction with Valentine’s Day and “Ren Ri” (14th February – 7th day of CNY), they will also be giving away a special dessert to all its customers. Writing this review makes me feel like going back there right now for another round. Yes, I could relate if you feel that RM500 to over a thousand for 6 to 10 persons is a bit on the expensive side and you can’t eat as much as you would at typical steamboat buffet restaurants, but what you pay is what you get. 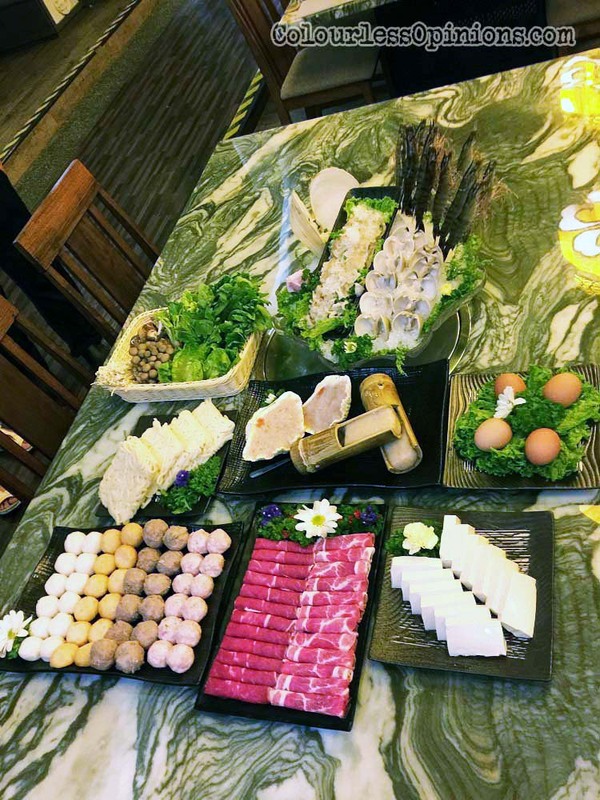 Yezi offers high quality steamboat, it’s going to be memorable, and there’s a reason why it’s an award-winning restaurant. Located at the The Roof — Sky Level of First Avenue Bandar Utama (Petaling Jaya, Selangor), Yezi is a full-fledged steamboat place with yellowish and considerably traditional ambiance and yet well air-conditioned with fantastic service by its staffs, perfect for people like me, who’re too lazy to cook even when with hot pot prepared. And if you’ve been to any where at The Roof, you’d know there’s bound to be a great rooftop view of the city. Make sure you call and book early to get that an awesome table on the balcony. Number to call — 012 323 5841 or 03 8605 3388. Pre-order and takeaway are also available.